In search of a great crêpe recipe? You've come to the right spot! 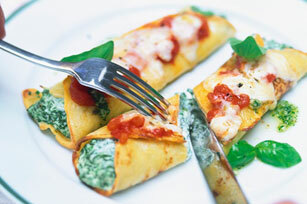 Our recipe for Italian Spinach and Cheese Baked Crêpes is a fantastic choice! Combine egg, spinach, ricotta, 1/2 cup shredded cheese and Parmesan. Spoon 2-1/2 Tbsp. spinach mixture down centre of each crêpe; roll up. Place, seam sides down, in 13x9-inch baking dish sprayed with cooking spray; top with pasta sauce and remaining shredded cheese. Cover.